This is a recipe that can be used in so many ways it’s always good to make more than you need and freeze the excess. Homemade is always better than store-bought in my universe, and I keep a container or two of this tomato sauce in the freezer at all times. It’s great on pizza, and is a real time-saver when you get an urge to whip up spaghetti with meatballs or fresh Italian sausage for a quick dinner. It also helps transform boring chicken breasts into much better-looking and tasting chicken parmigiana. Place a large, heavy-bottomed frying pan over medium low heat. Add the olive oil, garlic and onion. Saute until onion is translucent, add the tomatoes, basil and thyme. If the tomatoes are whole – smash them with the back of a spoon or fork. Season with salt and pepper, add the vinegar and some sugar if too sour. Cook for 5-6 minutes, until it begins to concentrate. Strain the sauce through a sieve, pushing with a wooden spoon or using a whisk. Put the strained sauce back into the pan and simmer for few more minutes until it is thick enough to spread on a pizza, or add a bit of water if it’s for pasta. Freeze any leftovers. This entry was posted on Monday, February 9th, 2009 at 6:05 am	and is filed under Mains, Recipes. You can follow any responses to this entry through the RSS 2.0 feed. You can leave a response, or trackback from your own site. 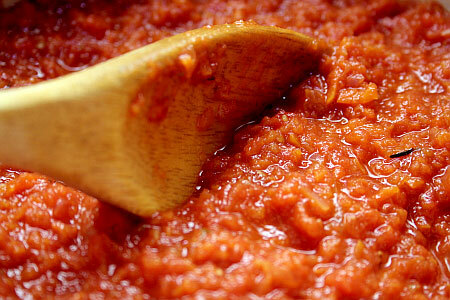 Great tomato sauce recipe! Simple, but very tasty looking. Great recipe Margo! Lately I’ve been making my own tomato sauce with fresh tomatoes and garlic and this recipe will obvioulsy improve my humble effort to no end.